In just 40 minutes, you can go from a hotel suite on Park Avenue to a rustic campsite in the park—Floyd Bennett Park in Jamaica Bay, to be precise. With tons of outdoor activities around, you'll want to camp for a couple days to take advantage of everything! There’s an abandoned airfield that stretches as far as you can see. You’re driving over the spot where planes have come and gone, and the road is bumpy as hell. The GPS is telling you to turn left, then right, and you’re blindly following and hoping for the best. This goes on for five minutes and just when you start to think that there’s no way it’s taking you to the right spot, you see it: trees in the distance, and cars in a parking lot next to a seemingly hastily erected set of trailers. After parking, it’s still not entirely certain you’ve found the campsites, but a sign points you through a small hole in the trees—when did the trees get there? You didn’t notice as you focused on the barren air strip in front of you on the drive in. But walk through the small trail, and suddenly, you’re in a charming, rustic set of lean-tos and camp sites. Someone is cooking hot dogs on a campfire, and grins at you. Another couple strolls by, laughing. It smells like charcoal and the sun is shining. It’s a strange sight, almost like walking into another world as you step through the trees. Narnia? Nope, It's just Camp Gateway. The campground is open all year, and it’s nestled right in the middle of Jamaica Bay, where there’s no end to outdoor activities you can do. The best part? All of this is under an hour from the city—in fact, it’s technically in Brooklyn. The Rockaway Gateway Greenway runs near the park, and the multi-use trail is a great road ride or run spot. For hiking, don’t miss the Dead Horse Bay or North Forty Nature trails. Swimming is available (and excellent!) over in Jacob Riis Park during the summer, so bring bathing suits—and also during summer weekends, there are free kayaking programs at the campground, so make sure you take advantage of that! If you get rained out while camping, the Aviatior Sports center nearby has indoor climbing and basketball courts. 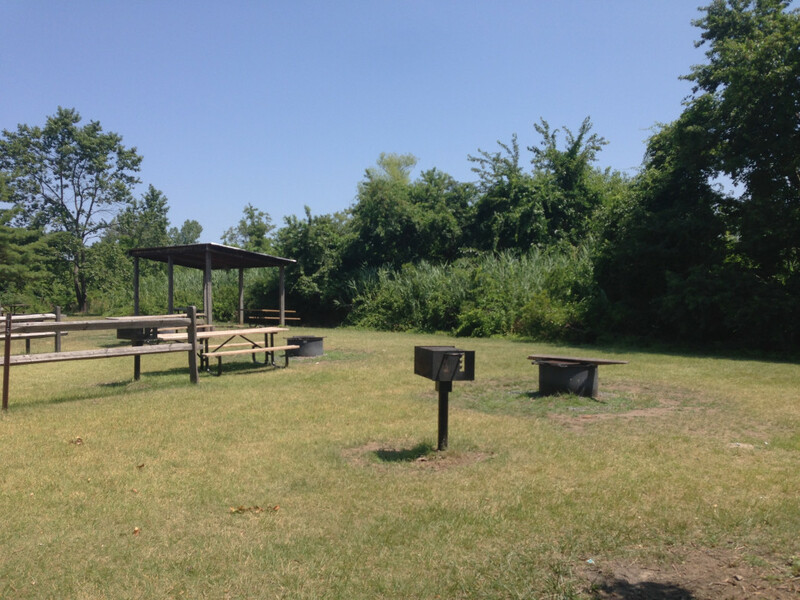 While the campsites are rustic—all complete with a fire ring, picnic table and charcoal grill—right in the parking lot is a tidy little camp store for anything you may have forgotten, as well as potable water, showers and flush toilets… No outhouses here! There are also RV sites available. It fills up fast as people struggle to escape the city for a day or two without making a big trip, so reserve a campsite if you’re heading there in the summer. If you’re nervous about camping in Brooklyn, the NYPD and Park Police swing by on occasion, so it’s secure—in fact, one officer I chatted with was there to check on the campsites, but also to see which one he wanted to reserve for a trip with his whole family! This is a great spot for families. There’s biking, hiking and bird watching at the camp, and just a few minutes away is the beach at Rockaway, where families can surf, swim or just hang out. There’s boating nearby as well, and the campground staff assures me that there’s almost no activity unrepresented within a few minutes of camp. The camping is at Floyd Bennett Field, which is 50 Aviation Road in Brooklyn.